Collaboration is the buzzword in our business culture. Leaders, team members, managers, and coaches all want us to collaborate. Interestingly, the term seems to engender immediate agreement. But what does it mean to collaborate? 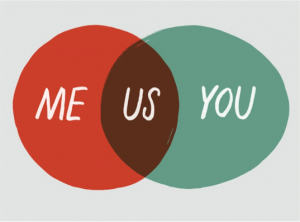 Even more importantly, what does it mean to be collaborative? If we dig into its synonyms a bit, we find words such as mutual, cooperative, cooperate, joint, collective, shared, united, and common. Sentimental: having conversations, getting together, connecting, and discussing. Both approaches seem casual and woefully incomplete, having less to do with cooperating than with transacting or discussing items. To Collaborate (As A Skill)? The word collaboration comes from the Latin collaborare, meaning “work together” (mid-19th century). This origin satisfies the question of what it is to collaborate: to work together. As a coach and researcher, I find that our 21st-century demands require an expanded definition when working with leaders and executives: to co-create a shared or mutual understanding that allows for coordinating action together. Today, we must include shared or mutual understanding as the background for true collaboration. Why? Simply because we are cooperating within the context of an Information Age, where interpretation is key to co-creating. Additionally, working together today involves coordinating action. Think about this. What is it you do with others that you do not do alone? Anytime we involve others, we do so with the intention of coordinating action; at minimum this means scoping out time, making agreements, and organizing and sharing information. We do not just talk about stuff—we work together. We schedule meetings to discuss thoughts, we share documents to clarify priorities, we connect to develop plans or strategies, and we deliberate together to cultivate ideas that we could not have alone. And, these activities happen within timeframes and deadlines, with information, and by involving others. To make collaborating even more challenging and ripe for misinterpretation, we often perform these activities across communication platforms and cultures. So, “to collaborate” today requires, at minimum, the ability to cultivate a shared meaning or understanding and to coordinate action, and that requires the ability to scope your time and manage yourself. Collaboration is, therefore, a responsibility to yourself and to another. 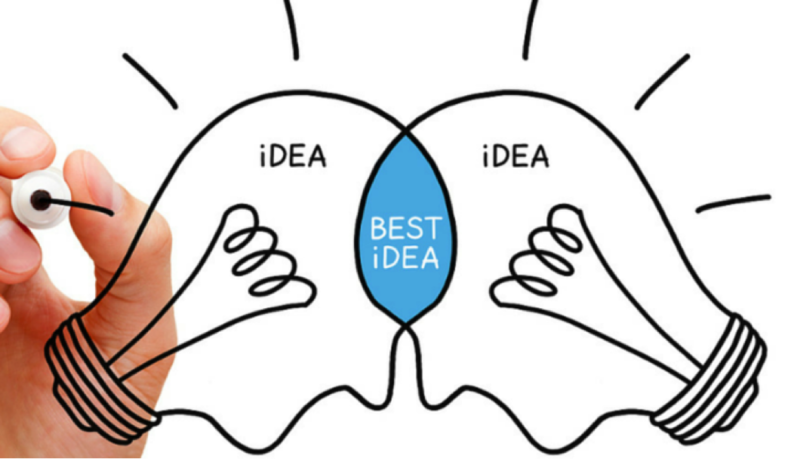 To Be Collaborative (As A Mindset)? Being collaborative takes this notion of collaboration to the next level, from a skill to a mindset. Mindsets involve who we are being, such as levels of awareness from a distinct capacity, worldview, assumptions, and beliefs. Different mindsets view skills and situations differently. There’s been a leap in understanding mindsets, with fresh thinking and insights from theorists such as Ken Wilber, Nick Petrie, Susan Cook-Grueter, and Robert Kegan. Each has added research that distinguishes a collaborative mindset from the skill of collaboration. 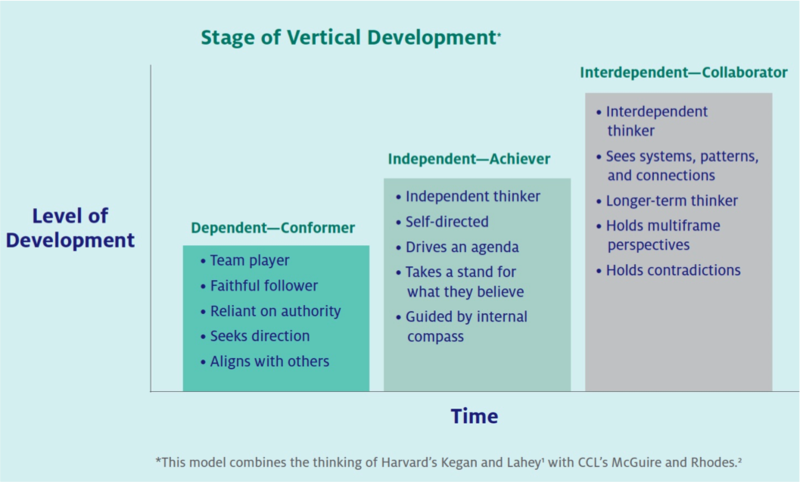 The graphic below by Nick Petrie of the Center for Creative Leadership distinguishes being collaborative as a mindset from two previous mindsets: conformer and achiever. It also connects being collaborative to an interdependent worldview, as different from the two previous worldviews of dependent and independent. Here, Petrie implies a larger claim: that a collaborative thinker or mindset involves more than merely working together. 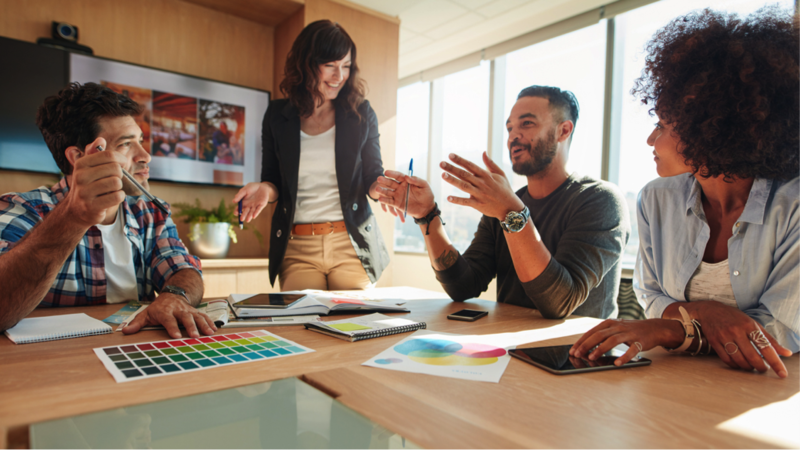 This mindset embraces an openness from an interdependent worldview that involves engaging multiple perspectives and holding contradictions, with an appreciation of systems, patterns and connections, and long-term thinking. When examining the mindsets, an often-overlooked aspect involves how each of the previous mindsets contributes to the evolution of the next mindset. This points to a critical implication: we develop necessary assets in each mindset that pave the way for us to grow into the emerging mindset, even catalyzing the expansion. Achieving collaboration requires successfully navigating the previous two mindsets: dependent–conformer and independent–achiever. 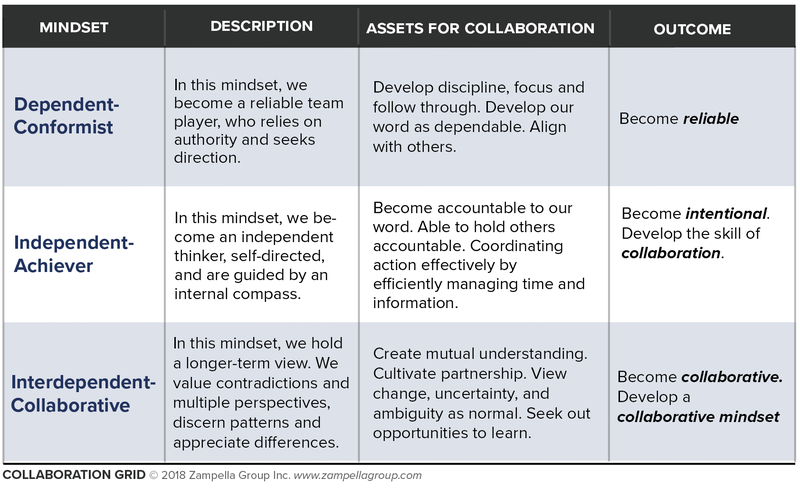 Whether collaborating as a skill or becoming collaborative as a mindset, we require specific competency from each of these previous two mindsets—that is, to expand (our perception) and include (previous assets). Dependent–Conformer: We gain many skills from this mindset. The three that help us as a collaborator include 1) becoming disciplined to focus and follow through, 2) developing your word as dependable to become a reliable team player, and 3) aligning with others. When properly developed, these competencies seed the possibility of collaboration. The outcome at this level is becoming reliable. Independent–Achiever: Leveraging the skills from the previous mindset is critical for expanding the capacity to collaborate. From this mindset we gain two competencies: 1) evolving a reliable word to become accountable to our word and be able to hold others accountable and 2) shifting from aligning with others (previous mindset) to coordinating action. This allows us to “work together.” We develop these assets from this mindset to become intentional. Grid illustrates assets from each mindset to develop collaboration as a skill and mindset. So, from these previous mindsets we can develop skills to collaborate and evolve into a collaborative mindset. coordinate action effectively with others, which involves scoping time. These aspects contribute to the skill of collaboration. What we develop in the interdependent–collaborator mindset are additional skills of cultivating shared meaning. This makes sense from an interdependent worldview where we hold contradictions and multiple perspectives, discern patterns and appreciate differences. In the collaborative mindset, leaders and managers not only work together but co-create conditions and context for working together. Problems are no longer obstacles; instead, they have become opportunities to discover and create together. With a longer-term view, we create a shared vision, with mutual understanding to cultivate connection and partnership. We also view change, uncertainty, and ambiguity as normal and seek out opportunities to learn. We gather additional perspective to collaborate, to gain a fuller view of reality, and to leverage the wisdom of others. In a sense, we become more together. Becoming collaborative is critical in a VUCA (Volatile, Uncertain, Complex, and Ambiguous) world. Indeed, when presented with material like this, we often look at the highest level and start there. Developmentally, however, the path forward often requires looping back and strengthening any lost assets from previous mindsets. This backward turn is, in fact, necessary progress. Developing the skills to collaborate deepens a skill-set that increases effectiveness and over time will lead us to become collaborative and operate from that mindset. To begin, take inventory of your gaps—asking others for feedback—and start wherever you are. Consider that whatever may be needed for additional practice might require looping back to an earlier mindset: the disciplined reliability from the dependent mindset or the intentional accountability developed in the independent mindset. With this foundation, it is now possible to become collaborative—to embrace the very uncertainty and ambiguity we fear most to cultivate the necessary openness that emerges in the collaborative mindset. From a collaborative mindset, we move beyond transacting business and become more together.